Moorings may be the right place at the right time. Located on the South End, these waterfront condos are on a quiet street and a peaceful canal. The bonus of The Moorings is that it falls into both the Boating Condos category and the Walk-to-Beach category. It's only a block or so away from the south beach access. With floor plans ranging from 1,100+ square feet to over 2,300, there is a wide-ranging selection of Mooring condos. All of them have ample storage space, open layouts, and the best possible shared amenities. You can work out in the fitness center or swim in the heated pool. Moreover, every convenience that is essential to a comfortable life is here. There are well-equipped kitchens and most of the condos have received updates and upgrades throughout. The Moorings has a maintenance fee of $544. This is about average for comparable condos on the South End. It covers all the usual stuff like common insurance, water & sewer, recreation facilities, pest control and much more. A good-sized piece of the maintenance pie in Florida is always what is commonly called "hurricane insurance." It's included in the condo fee. The Moorings doesn't allow pets, but many waterfront condos do. Breezy Point, for example, does and it's right down the street. Check out our Waterfront Condo Comparison to see them all. The minimum rental period here is 30 days. If you want your investment to cash flow, owner must make sure it's rented solidly through the high-season. 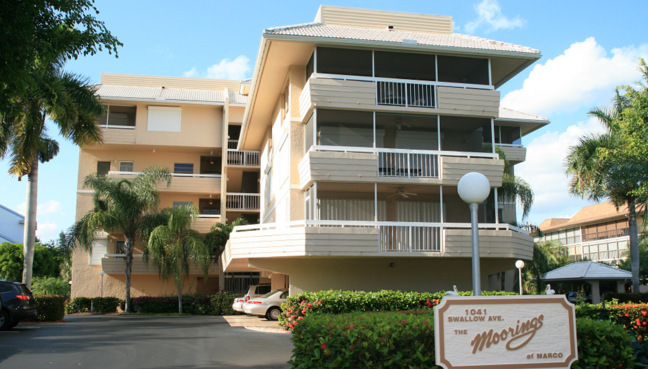 There are two different floor plans in Moorings. Most units are 2-bedroom plans that sit high above one of the most picturesque canals on Marco Island. There is also a large, 3-bedroom penthouse that is absolutely stunning. Click here to see all Moorings floor plans. Marco Island is a world famous tourist destination and Naples is a world golf center. Take advantage of the rich variety of activities offeered and be a tourist without all the hassle that goes along with being a tourist by owing at Moorings of Marco. You can sip a cool cocktail on your own private porch or patio and watch the fuchsia tinted sunsets over the Gulf of Mexico. On the other hand, if culture and fine dining are more your cup of tea – you are easily able to get into Naples to enjoy the sophistication and delicious elegance that is on offer there – all moment’s away from your doorstep.